If you are looking for what can only be described as Australia's best salty plums then look no further. 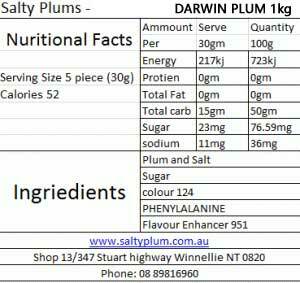 Otherwise known as Darwin Plums, Pink Lady Plums, NT PLUMS or Even "Salty Plum man" plums. These salty plums have exactly the right mixture of sugar and salt. People have described these as the plums they remember from their childhood. We have plenty of reviews on our face book page and in the review section of this page which will prove that these are the best plums in Australia. Was reminiscing about Salty Plums recently so I ordered a 1kg pack of the red Salty Plums (aka "Pink Lady / Darwin Salty Plums") at 10am on a Friday and they were here before 10am on the following Monday!! Talk about being Express - that was mega-Express! As for taste, they are very close to what I remember devouring in the 1970's .. and if you are anything like me, mention the word "salty plums" and the mouth just automatically waters. Highly recommend these ones! The last two bags I have received are very moist. I much prefer the red drier ones as these taste ok but not quite ready yet . Kind of underdone. Some of the packet are actually too salty and sour. Having grown up in Darwin and eating Salty Plums all my life, I consider myself to be somewhat of a Connoisseur of the delicious preserved fruit. These ones are particularly good and the freshest I have ever eaten. The only problem being that I end up with a red mouth, small price to pay.....Ha Ha. Seem a little wet and darker compared to the last bag I got. Not as dry but they are a little sweeter so that’s not a bad thing. In used to the very salty, heavily coated, dry plums, so I find these a little disappointing. They are large, and quite plump and less dry. I find them much too sweet and barely salty at all. They would be good as an introduction plum for someone who has never tried one before. Tasty treat but too expensive. The best I’ve had in years. Sweet, full of moisture & definitely value for money.